Counters covered in stock, originally uploaded by Noladishu. This is the results of our recent stock making experiment. We took the darker stock on the right and made onion soup out of it. The problem with making onion soup is that all of the recipes seem to call for random quantities of medium sized onions. Most of the onions I like here are enormous vidalias and texas sweets, which are approximately the size of a softball. So I put a few things together and made my own. Serves 2 with leftovers for the next day, 4 if you only count on one bowl each at dinner. Slice onions into thin half-moons. Melt butter, brown the onions (don't stir them too much) in it, and this takes forever. Minimum 20 minutes. Pour in the balsamic vinegar, use it to deglaze the pan, add the stock and the herbs. Add some salt and pepper. Cook at least forty five minutes or so. Fix up with some variant of bread and melted cheese. 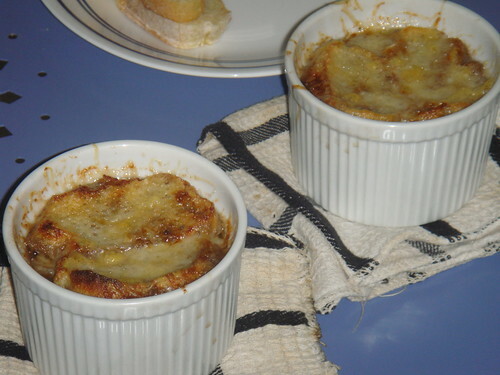 I finally got around to buying cute soup crocks, so I actually did it this way recently....put into crocks, toast up some french bread, float it on the soup, mound a pile of grated swiss-type (Gruyere anyone?) cheese on it and brown the tops. 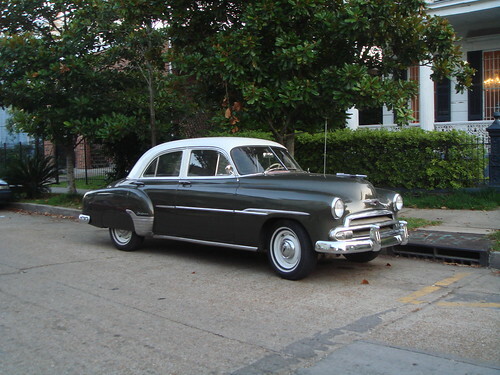 DSC01607, originally uploaded by Noladishu. This post is partially to remind me to use up the stack of peaches sitting in the kitchen. It is also to remind me to post the -rest- of the pictures my dear food photographer took of all of the madness going on lately in our kitchen. 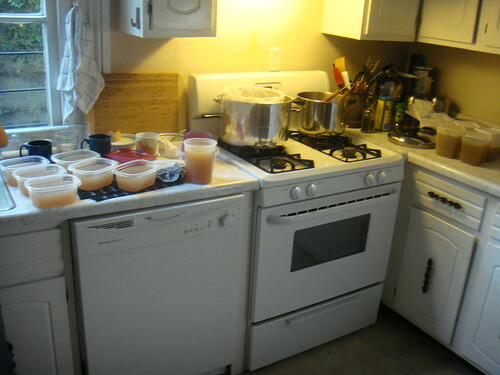 We made stock - in the middle of summer - partially in celebration of the fact that I now have an air conditioned kitchen for the first time since Katrina. And a washer and dryer -- indoors! And a dishwasher for the first time since 2000. The peach tart is incredibly simple. 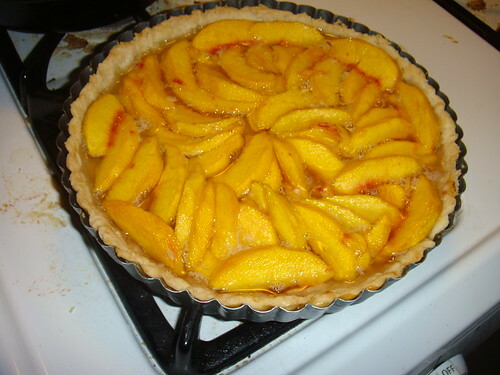 Make a partially cooked pate brisee tart shell, arrange peaches, put lots of sugar on top, bake. Eat. The part of me that has a french final on Monday is fussing at the lazy half of me for not putting the accents on those words. on the street. Post here. neighbors seem to like her. For now I'm just grinding through to the end of the summer semester. I even have a French test on Bastille Day.